What are teacup pigs, really? To be perfectly honest, yes there is a pig that fits into a teacup. After all, there is evidence plastered all over the internet of these creatures wearing cute boots and posing with ice cream. Seeing that much tells you they exist, right? While true, it’s also misleading. What you are seeing are piglets, not pigs. 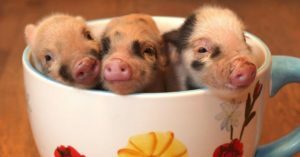 Technically, they are pigs but because they are small, they can really fit into a teacup. In fact, it is their small size that drew celebrities like Paris Hilton to want to own one. The problem is that marketing a pig as “mini” or “teacup” in size is just that – marketing. It’s for effect. What you end up with a few months after making a purchase won’t be teacup-sized at all. They will be full-grown pigs with needs that you may or may not be able to provide. Where Did All This Teacup Pig Madness Begin? You don’t have to go very far back in pig history to trace the trend of breeding smaller porkers. The story begins in 1986 in the U.S., a time zoos imported Vietnamese pot-bellied pigs. Some private breeders were intrigued and they soon tried different things with their animals. One group of private breeders decided to breed – inbreeding can’t be ruled out as well – and underfeed their pot-bellies, producing oinkers that are smaller than the usual farm hog. These breeders also tried out the strategies on other small-sized pigs, such as the kunekune from New Zealand and the Ossabaw Island pigs (descended from Spanish pigs) from the state of Georgia. In short, doing this produces smaller than usual pigs BUT they don’t always remain the same size for the duration of their life. In fact, how much they end up weighing can’t be predicted. Thanks to false advertising and the interest of some celebrities, many people started warming up to the idea of a pig as a pet. However, the pigs are given up or abandoned when they balloon to a full-sized farm animal. What Happens to Abandoned Teacup Pigs? Let’s start this off with a story: Steve Jenkins and Derek Walter, both Canadians, adopted a “mini pig” called Esther as a favor to a friend. The pig was just three pounds when they got her, but weighed 500 pounds after two years. Rather than give her away, Esther’s owners decided to keep her, even moving to a large place to accommodate her needs. In fact, Ether’s owners were able to open a sanctuary thank to the donations that poured in from all over the world. You can count Esther as one lucky pig to have owners who cared so much about her that they changed their way of living to keep her. Like Esther, many other teacup pigs have found new homes in sanctuaries. While that fact is heartwarming, the number of pigs that get adopted is heartbreaking. The Forgotten Angels Rescue and Education Center in Deer Lodge, Tennessee receives as many as 10 calls a day regarding false “mini pigs.” The Ross Mill Farm in Rushland, Pennsylvania adopts out 60 pigs a year. The Best Friends Animal Society has also taken in stray pigs that have either been let loose or left behind since the early 2000s. The Ironwood Pig Sanctuary at Marana, Arizona has also seen an increase in mini pig numbers, from 329 in 2005 to close to 600 in 2014. Although the number of sanctuaries have increased, there’s not much money to go around. This means that in certain havens, overcrowding is an issue and because of that, some have opted to shut down. Not every abandoned micro pig – another nickname for small-sized porkers – makes it to a sanctuary. Others have met more brutal ends. 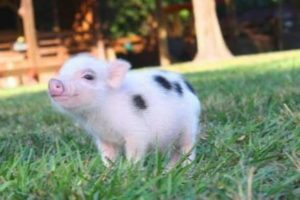 What You should Consider Before Get a Teacup Pig? In the U.S., an organization called the American Mini Pig Association has set up a strict code of ethics, along with height-based breed classifications to address the issue of false advertising. Reputable breeders, sanctuary owners, and rescuers all agree that education is vital in ensuring everyone stays happy. Interested owners who want a “mini pig” have to be told what to expect when buying one. And yes, that includes letting them know that the “mini” they purchased today won’t be so mini in a few months. Doing so will help buyers think really hard about whether purchasing such an animal is truly what they want. Most of us are attracted to cuteness, but what happens once that stops? The most likely scenario is depressing: the animal almost always gets abandoned, neglected, or given away. So if you ever desire to have a teacup pig, know that it won’t stay tiny for long. And if you do really want a pet pig, know everything you can about them so you can know what to expect when you live with such a creature. Keep in mind that pigs can breed when they are as young as three months. This allows some irresponsible breeders to keep up the illusion of “smallness” because when they show off the parents, you will surely be looking at a “small” pig. So what can be done about teacup pigs or any of its other labels? Be a responsible person and don’t fall for the trap. But if you are ready for the responsibilities of having a pet pig, then you might consider adopting one. Or, if you are depressed about what you have just read, making a donation to a sanctuary helps ensure the pigs sent there are cared for and that the place actually remains up and running for any other abandoned animal. What are the things to keep in mind when caring for a pet pig? Pigs need kits of room to roam. In other words, if you own a tiny place, that might not be the best place to raise a pig. You might end up with an animal that is depressed and unhappy, leading them to act all moody and territorial. Keep in mind that pigs love water and mud, so unless you can provide those, maybe you should look for a different animal companion. Pigs are expensive. If you balk at the expense of keeping a cat or a dog, how would you feel if you were told that one pig eats A LOT? It doesn’t just end there: pigs also need veterinary care but of the specialized kind. Pigs are meant for farms or areas where they can roam. Yes, you may call them a pet but since they are classified as livestock, there are only select places where you can keep them legally. In other words, you may have the money to keep and care for a pig but if you don’t live in the right place, then what you are doing is illegal. Humans have domesticated pigs for thousands of years. However, unlike the domestication of dogs and cats, pigs were never meant to be pets. They were essentially bred for the purpose of providing food. Although pigs are smart, it isn’t easy to live with a creature that has been considered prey for many years. Then again, they have proven to be great company but you have to be willing to provide for their specialized needs: they are huge, need a lot of space, and are in their best behavior when in twos. 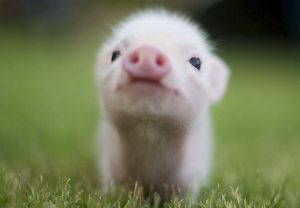 So if you hear someone raving about their teacup pig, you might as well ask if they have been told everything there is to know about their “pet.” If not, you could direct them to proper sources so that they are made aware and can decide whether they still want to keep the pig or give it up for adoption. 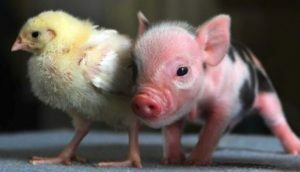 There’s no use in making life miserable for so-called mini pigs and whatever else they are labeled with.